Sorry for not posting the last couple of days, I still need to get used to the concept of blogging while travelling. I’ve spend the last couple of days in the Dolomites Mountains of Northern Italy. 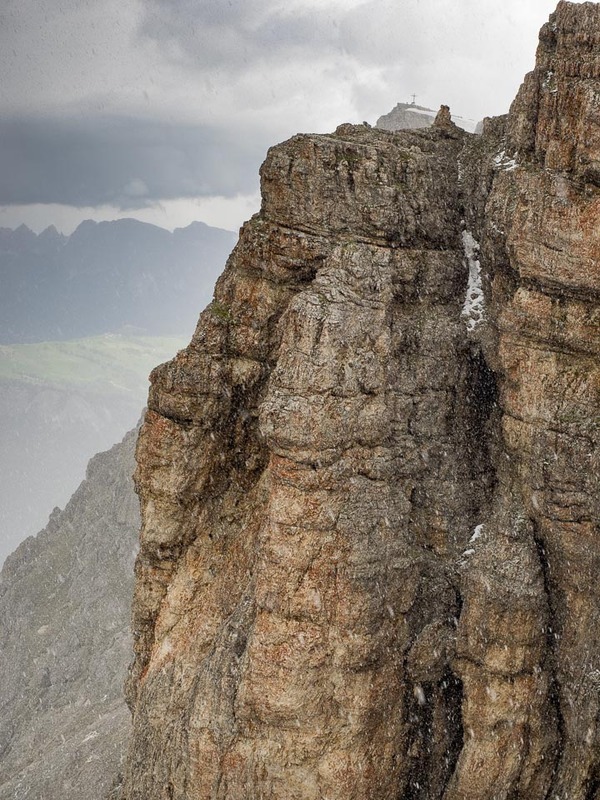 A zone called the “Blood Mountains” after the fierce mountain warfare that took place between Austrian Imperial Troops (Kaiserjäger) and Italian mountaineers (Alpini) during World War I between May 1915 and November 1918. To learn more about the history and our adventures in a mountain continue reading after the jump.. 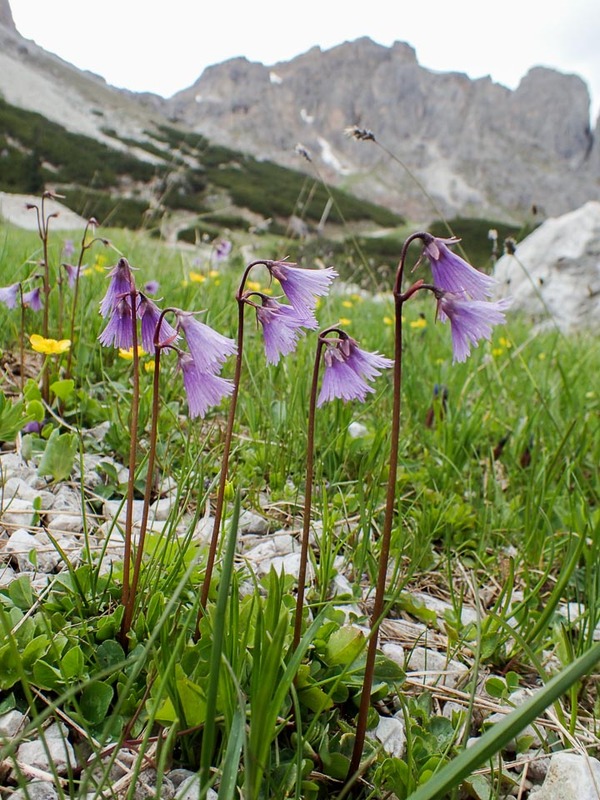 The road to World War I starts at the Valparola Pass (2100 meters above sea level), at the border between Italy’s provinces Alto Adige and Veneto. 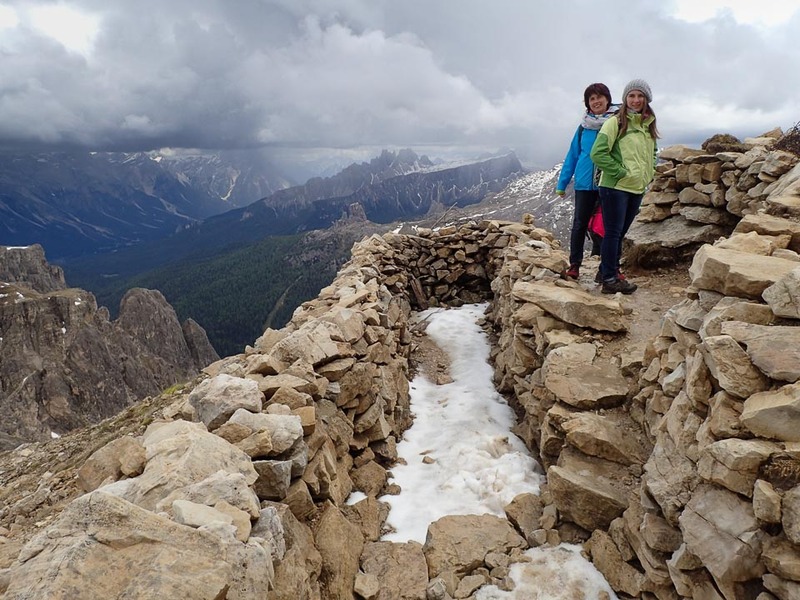 From Valparola you can also enjoy a spectacular view on the barren face of the Lagazuoi summit (2778m). It is a peaceful and beautiful landscape that lies in front of us. 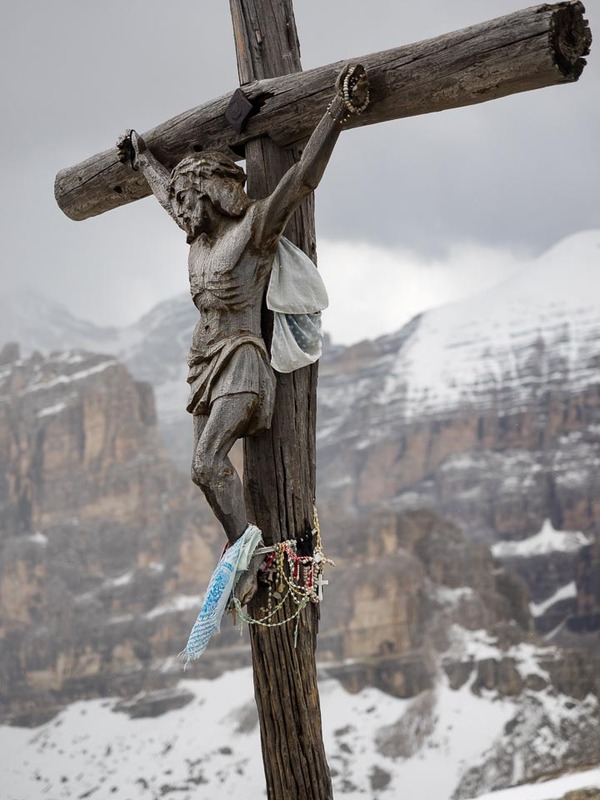 But about 100 years ago in these mountains at the former border between the Kingdom of Italy and the Austro-Hungarian Empire one of the most gruesome chapters of the first World War was written. 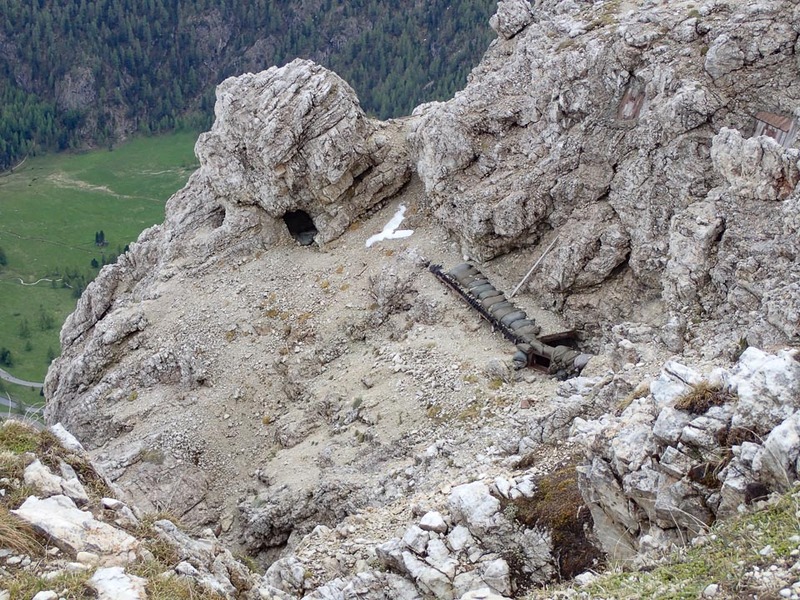 After the government in Rome declared war on the Habsburg Emperors in Vienna in May 1915 the peaceful landscape changed into a high altitude alpine hell, with traces of the conflict still visible everywhere today. 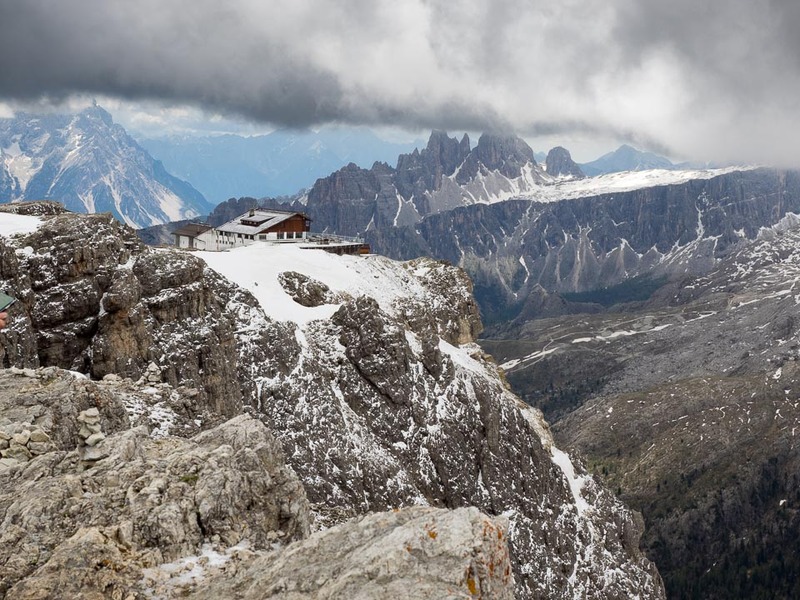 The Lagazuoi (2778 meters) was occupied by Austrian Imperial Troops on the western side including the summit area, on its eastern side it was under control of Italian Mountain Brigades (Alpini). The Alpini tried to retake the mountain by breaking out caverns and fortifying them with machine guns and artillery. 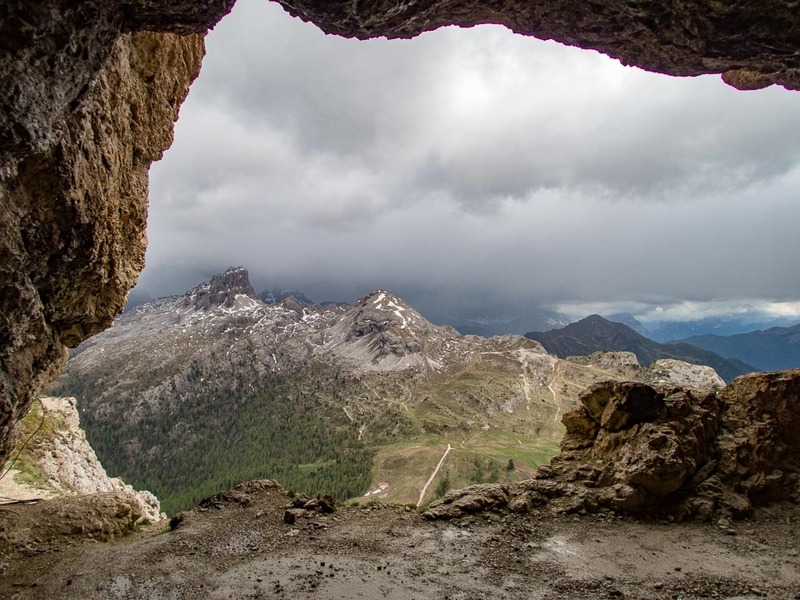 The Italians started to drill an access tunnel upwards through the rocks to get protected access to the top part of the mountain with the intention to break out a cavern near the summit, fill it up with explosives and blow up the summit area together with the Austrian occupants. 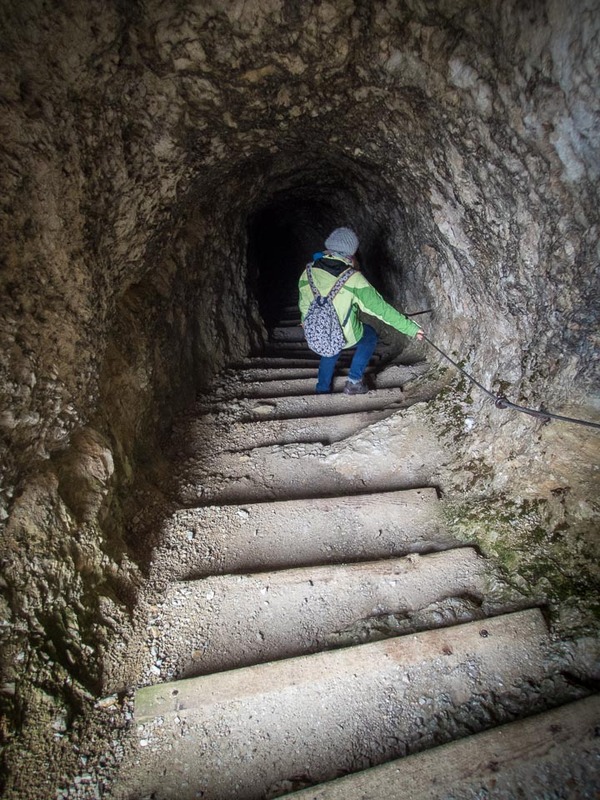 When hearing the drilling and the blasts of the enemy the Austrians decided to counter the attack by drilling a tunnel of their own to catch the Italians on the lower summit through wich they were approaching. 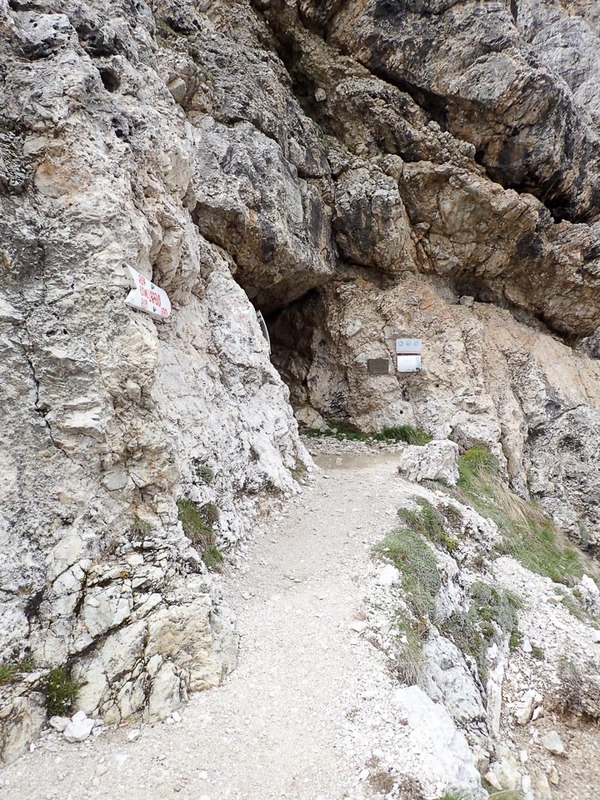 The Austrian tunnel was 93 meters in length from the top down towards the lower summit of the Lagazuoi, the Italian tunnel was more than 1000 meters in length upwards through the nearly vertical face of the mountain. Trying to beat the approaching enemy the Austrians executed an initial blast that exploded the already loaded mine chamber of the Alpini. Despite losses and the setback the Italian Mountaineers continued their quest by building a new cavern. The Imperial Forces, having ready their own cavern, loaded the room with thousand boxes of explosives, a total of 30.400 kilograms. They timed the blast with the expected arrival of Italian forces to supply ammunition and provisions. At 10 pm of June 20th 1917 they blew up the lower summit of the Lagazuoi, creating a hole in the mountain 200 meters high and 136 meters wide. More than 200.000 cubic meters of rock tumbled down to the valley floor. With the explosion the work of 18 months of tunnel drilling by the Alpini was annihilated. Between 150.000 and 180.00 soldiers lost their lives in the Alpine conflict of World War 1 between May 1915 and November 1918. Most casualties came from the harsh conditions of alpine warfare, with ice, snow, avalanches and temperatures of -40 degrees in winter. Supplies had to be carried up in altitudes of more than 4000 meters. In these 3 years the front line between the two armies hardly changed. We took the cableway up the mountain (800 meters ascent in 3 minutes) to reach the easy walkable top part of the mountain. Via the Refugio Lagazuoi we walked up to the summit. After initial sunshine the weather changed real quick to snowfall (and this in mid June!). After returning from the summit we had a great light lunch in the Refugio. Then we descended a small and adventurous path down the steep mountain face towards the entrance to the tunnel system. We had to cross snow fields and negotiate narrows with the terrain dropping several hundred feet directly next to us. Good shoes and balance are essential to reach the tunnel entrance. During the decent we can clearly see the areas where the explosions ripped apart the top of the lower summit of the Lagazuoi. 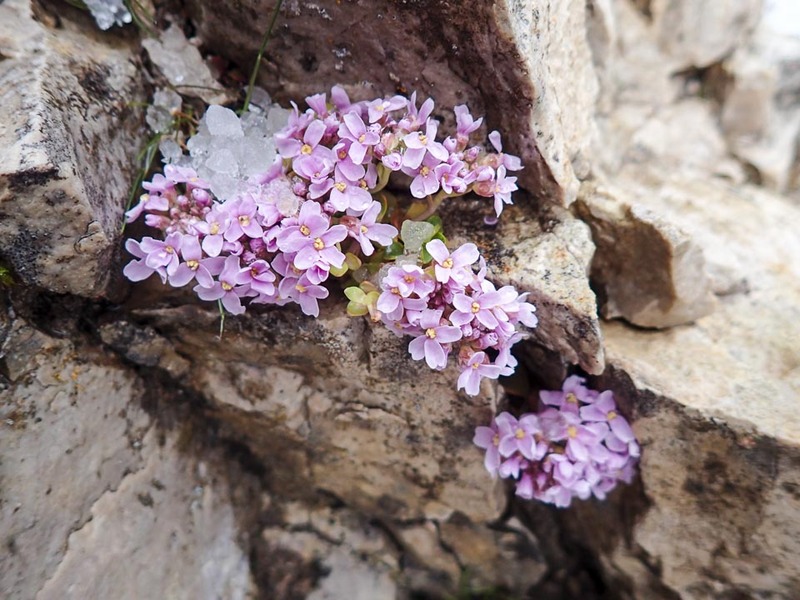 We found some beautiful mountain flowers visible between all this rocks, you can’t help to wonder if 100 years ago they were a sign of hope to the soldiers going through hell up here. 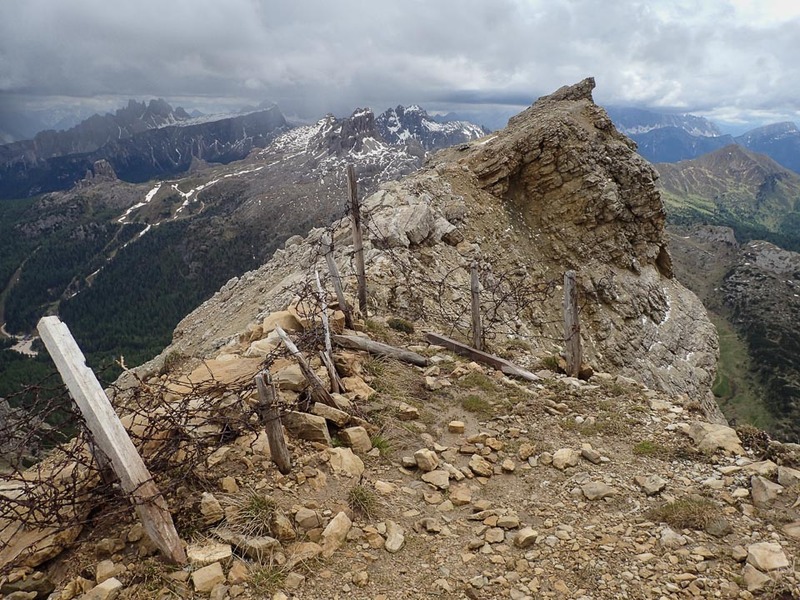 After a good 30 minute hike we reached the lower summit of the Lagazuoi with remains of barbwire and trenches of the Imperial troops visible everywhere. Remains of WW I barbwire on Lagazuoi lower summit. Finally we saw the entrance to the tunnel system on the blown up lower summit area. Initially we couldn’t find the tunnel entrance in all that rocky chaos (signage is rudimentary at best), but a man climbing out of the tunnel on his way up pointed us to the right entrance. 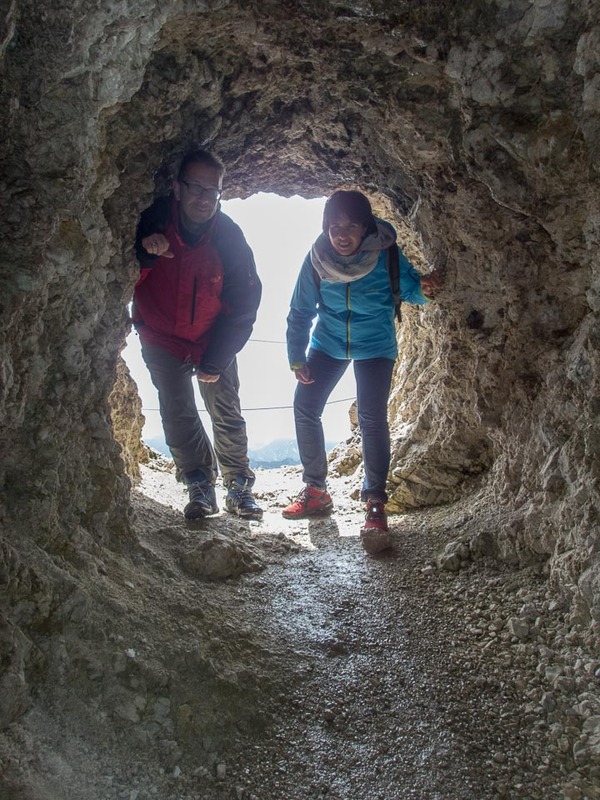 Having good hiking shoes and sufficient torch-light is essential to enter the tunnel system and climb down through 1 km of unlit tunnels towards the exit at the mountain base. Generally there are steps down throughout the tunnel, although some in bad condition. 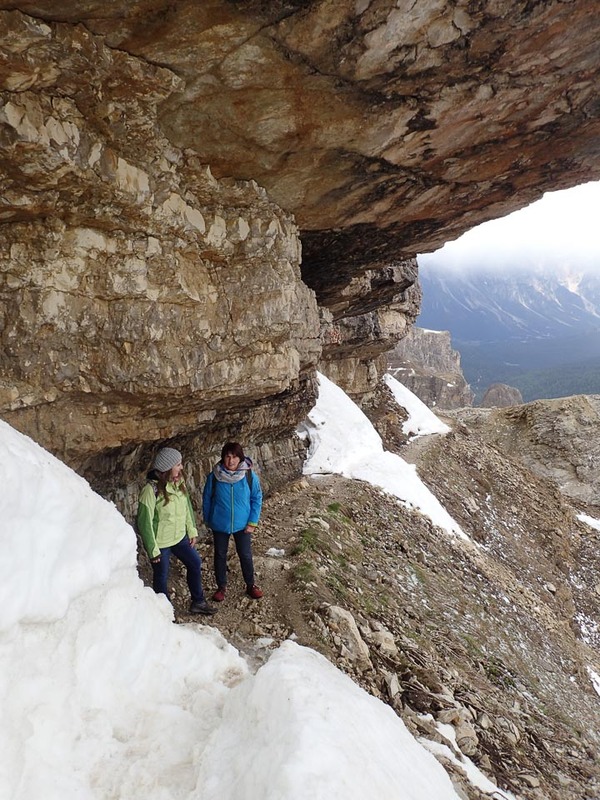 It is slippery and snowy (even in mid June) as snow and water enters the tunnel system. There is a cable you can hold on to while descending. Most of the way goes through complete darkness. You can imagine the horror of the soldiers drilling and blasting their way through the mountain, the immense work it took these 18 months necessary to make their way to the top. Every once in a while the tunnel gets close to the outside face of the mountain where the constructors drilled view holes (also used to shoot artillery) that provide some natural light and spectacular views of the landscape below. It also gives you confidence you are not completely lost in the claustrophobic dark tunnel system. On the steep way down there are some additional tunnels off the main way. It is vital you take time to study the signs at the crossings in order to find the correct way down. Also for this it is essential to have ample lighting with you because the signs are not lit and otherwise in total darkness. On the way down you pass some caverns built to house machinery or the living quarters of the mountaineers. Soldiers worked, ate, slept inside the mountain, being somewhat protected from the harsh elements especially in winter. The interior of the caverns is furnished with original items from the war 100 years ago. After two hours in the tunnel system and 600 meters lower we reached the exit of the tunnel system in a big cavern at the base of the mountain that served as the base camp for supplying the tunnel builders and as artillery station to shell the enemy across the valley floor. From there on it was another 30 minutes of steep descent down a path across rock fields to reach the parking at the cableway station. We passed some more ruins of barracks on our way down. We also saw some Marmots. 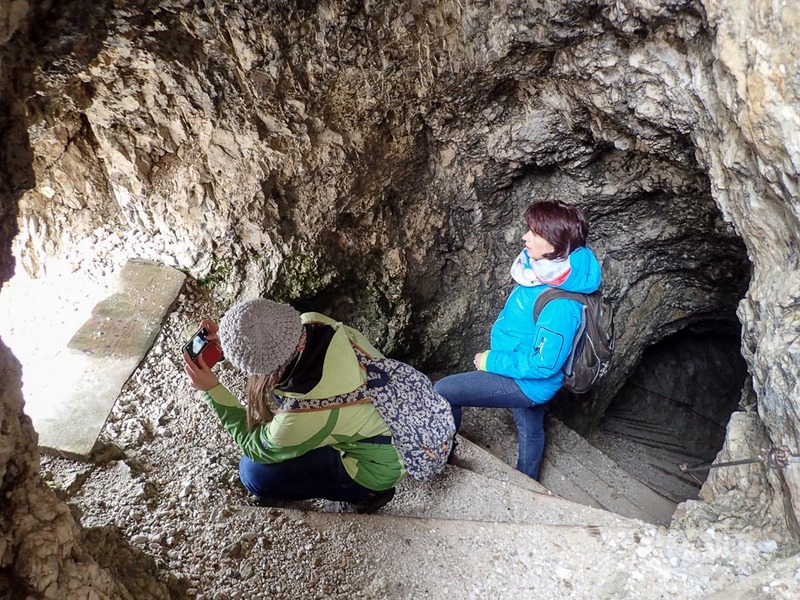 It was a great adventure, climbing through this historic tunnels through the insides of this great Dolomite mountain. With the temperatures and the snow in mid June we got a feel how it must have been for those soldiers in Winter with temperatures of minus 40 degrees celsius and 5 meters of snow. The horrors they must have experienced in those tunnels with the sounds of drilling, blasting and the artillery fire outside. And you get a feel how senseless it was in the end to sacrifice all those lives for practically no shift in the front line during the 3 years of war. There is also a very impressive museum on nearby Falzarego Pass covering the story of this Alpine war. I will do a separate post about that. The photos from the top of the mountain were taken with the Olympus OM-D E-M1 with the mZuiko 12-40mm F/2.8 Pro Zoom. After getting a Memory Card error before we started descending through the tunnel system I had to switch to my Olympus TG-4 Tough Cam I also had in my backpack, as I forgot to bring a spare memory card. Although the IQ of the TG-4 sure is not reaching the one of the big E-M1, having lesser but working cam in this situation beats having only a dysfunctional cam. And I need to make sure I have spare SD’s in my bag! Thanks, indeed it is. 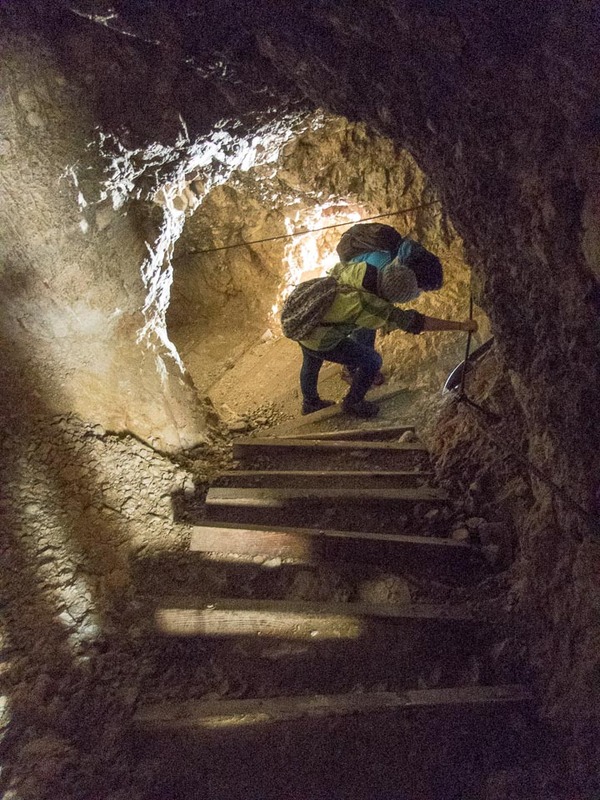 One has to experience this first hand, it is impossible to relay via text or photographs the feeling I had while descending through the mountain, imagining the terror these young fighting kids must have felt in the tunnels. I have reread your post and now have some time to ask questions. There was so much to take in. Do you think the tunnels will remain open to visitors for long? I imagine erosion over more years might make the trek too dangerous if not impassable. I had heard of this battle before but having the images of where it took place was informative and shocking more than any reportage could be. 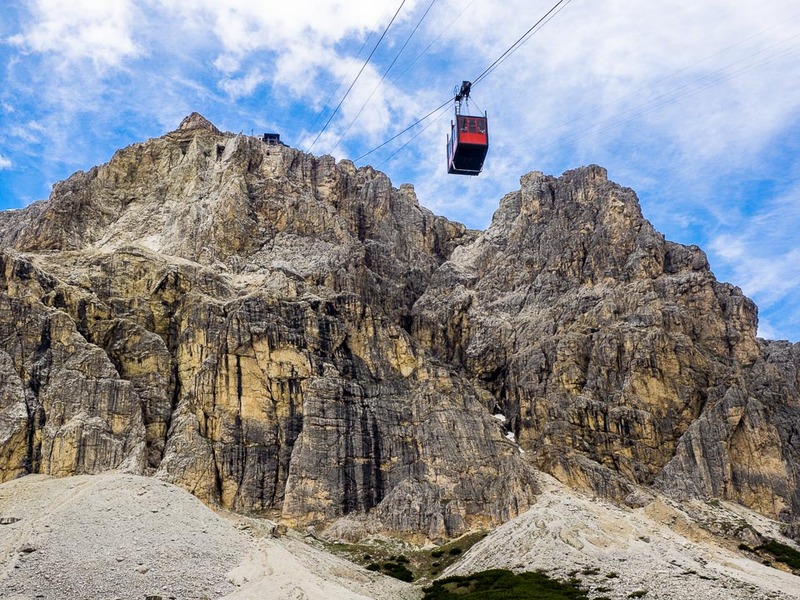 This blog post captures some nice impressions and the history of the Lagazuoi, a mountain (area) in Northern Italy’s Dolomite region. 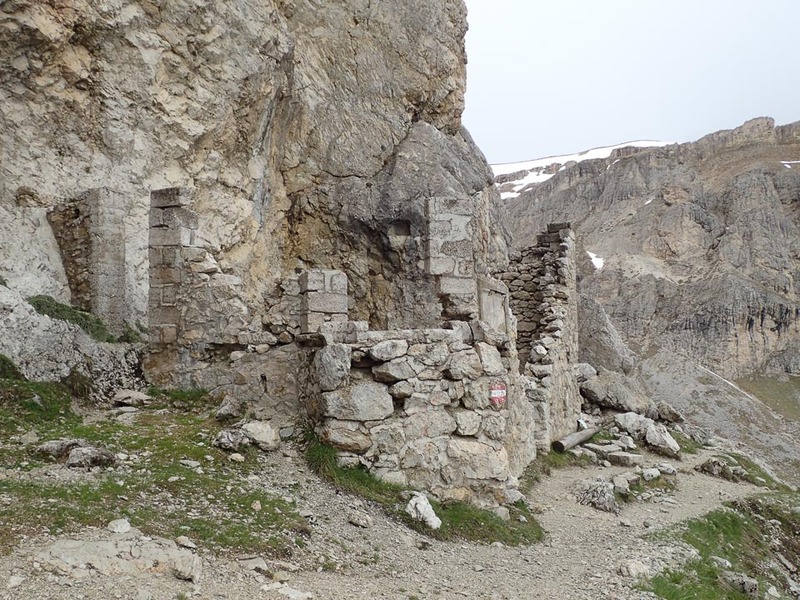 I just returned the other day from that mountain with a group of photographers (we were on a photograpy hike in the Dolomites), so I was happy to stumble upon this post with the nice pictures and the history of this war marked area (Italian and Austrians fighting in WWI). Great to see those pictures and to read about Lagazuoi and its history. I just came from Lagazuoi two days ago (today is Oct 11, 2016) with a group of photographers, having organized a Dolomites photo hiking tour. 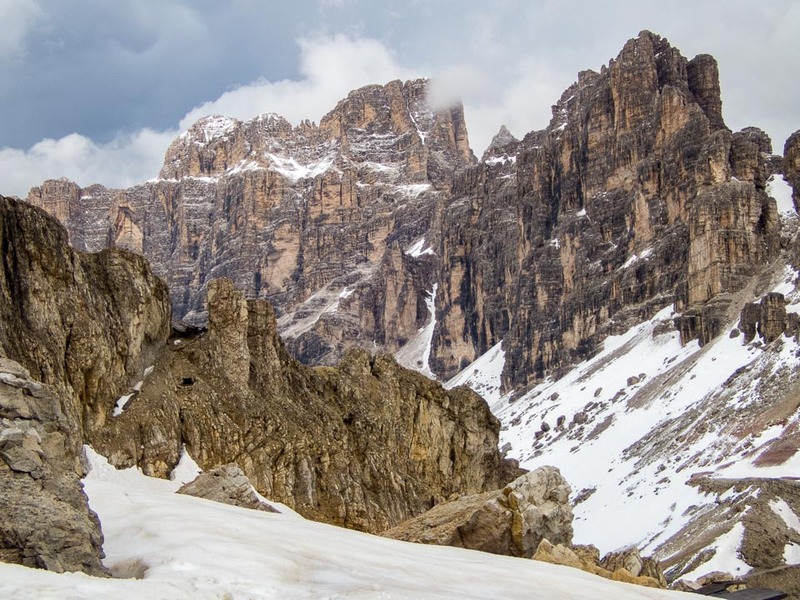 The last day was on Lagazuoi, but it started to snow and it got foggy…so some of the views I see in the pictures above we couldn’t see….Great pictures! 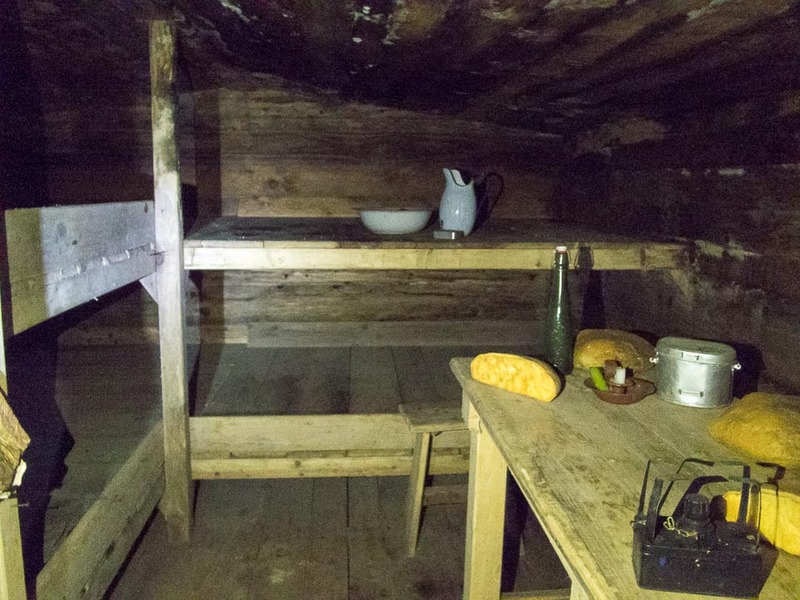 Next time I would like to see the tunnels and barracks from the war. No chance with the snow that surprised us. Thanks for making the effort to write about the history and sharing it. glad you liked the post 😊 Isn’t Lagazuoi and its story captivating, even today after all this years? I’m sorry you had bad luck with the weather, but even in summer we had snowfall on top. its an amazing place! We were a little bit lucky, the sky/fog broke open several times, just for a few 10-15 minutes, enough that the group of photographers had a chance to get some cool pictures. I am amazed you had snow in JUNE!